Visitors to NYC can get an authentic city loft experience by renting out this chic and contemporary split-level apartment in Greenwich Village on Airbnb. Although the 500-square-foot abode is certainly compact in size, its high ceilings and minimalist features give the space a cool, welcoming atmosphere. 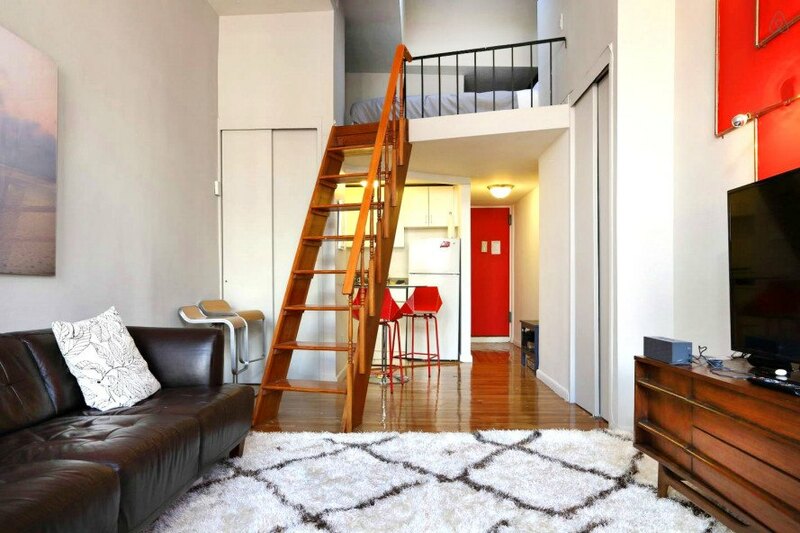 Located just south of Union Square, the tiny apartment is undeniably located in a great area. Additionally, according to the owner’s description, its the apartment’s coziness that will provide visitors with a “quintessential NYC feel”. Like most compact spaces, the devil is in the details. The Greenwich Village apartment has large windows that bring in a lot of natural light while a loft space upstairs is home to a comfy bedroom. Minimal furnishings give the apartment an open, airy feel. The bathroom and the kitchen are also fairly small but serve their purposes. And while the apartment’s rental fee (about $250/night) is somewhat on par with what you might pay at a hotel in the city, it’s actually quite a bargain considering the neighborhood and extra space. Located just south of Union Square, the tiny apartment is undeniably located in a great area. According to the owner's description, the apartment's coziness make it the perfect place for visitors to NYC. The owners of the tiny space promise that the space will provide visitors with a "quintessential NYC feel". The kitchen is small, but has everything a visitor would need. The loft space upstairs with the bedroom, almost doubles the actual size of the apartment. A small, but clean bathroom. Renting for around $250 a night, the apartment's rental fee is also authentically New York.